Then I smelled it. Poop! Right on time! After several days of stools loose and frequent enough that Tim and I agreed Pedialyte was in order, Shelby appears to be back on her "regular" schedule. I scooped her up, noting as I walked that we indeed had our first Thirsties blowout (not due to user error) at the gusset around one leg. "Maybe it was how she was sitting?" I pondered, "Or the fact that at 18 pounds she's precisely on the line between size 1 and size 2 covers?" I don't know who coined the term "Holy" crap but they obviously didn't have a toddler. It had only been 24 hours since her last poo, which had resembled her previous meal of sweet potatoes. The meals between simply could not explain the contents of her diaper. Grape skins??? It had been at least three days since she had grapes? Other meals had come and gone since grapes? I set her on the potty, hoping anything else that needed released would come out now before her bath. She sat for only a moment then took off ... unencumbered by clothing she's much faster. Deciding a few minutes of "naked baby" might be good for her, I gently picked up both diaper and liner between two fingers and went to spray them off. 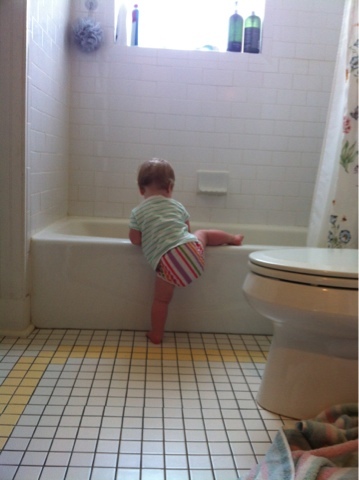 Once the diaper was as good as it was going to get, I decided I had a limited window of opportunity. The bathroom door was firmly closed and the naked toddler was not trying to break in. Better to clean now than try to take the diaper and return for cleaning. Desperate and not wanting further contamination, I flushed the toilet and dropped the offensive diaper and cover into the bowl (hey, that's how they rinsed them before diaper sprayers!). I folded up the mat to take to the wash and set about using up too many Clorox wipes; better safe than sorry. A noise in the hallway tells me my time is up. As if to confirm this thought, I hear Shelby fall and begin to cry ... a stumble is just too much when you have just realized you've been locked out of the very room mommy is in. I scooped her up with the hand that wasn't holding a very wet and very contaminated diaper on the verge of dripping and flew to the diaper pail. Re-decontaminated toddler with yet more wipes. On the return trip I soaked up the mess with a former spit up cloth and yanked two Clorox wipes out of the container ... one for the mess in the hall, one for the mess in the kitchen. Finally ahead of the contamination, Shelby had a lovely bath and I started a load of laundry, surprisingly none of which had poop on it. Today is going to be a "no-pants" kind of day I think.